Galveston, Texas, is a charming, slow-paced island city along the Gulf of Mexico. A popular Texas tourism destination, Galveston is home to lots of lovely beaches, restored 19th-century storefronts and fancy Victorian mansions. Galveston has approximately 1,500 landmarks listed on the National Register of Historic Places. The commercial buildings in Galveston's Strand National Historic Landmark District, now commonly called the Historic Downtown Shopping District, are among the finest collections of Victorian iron-front architecture in the U.S. This area houses boutiques, bars, restaurants and galleries. It's also the site of major entertainment festivals such as Mardi Gras (February or March) and Dickens on the Strand (December). The nearby revitalized Postoffice Street Arts and Entertainment District, considered part of Galveston's Historic Downtown Shopping District, is home to Gallery Row and its art galleries. 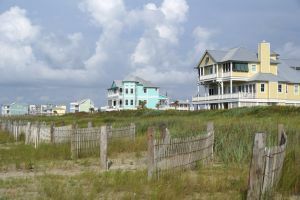 For these reasons, Galveston attracts thousands of visitors who find that a stroll downtown can be just as pleasant as a walk on one of its beaches.